Carol Ann Duffy has invited fifty of her peers to choose and respond to a poem from the past. With up-and-coming poets alongside more established names, and original poems alongside the new works they have inspired - Paul Muldoon, Vickie Feaver and U. A. Fanthorpe, for example, engage with classic works by Philip Larkin, Emily Dickinson and Christina Rossetti - the result is a collection of voices that speak to one another across the centuries. 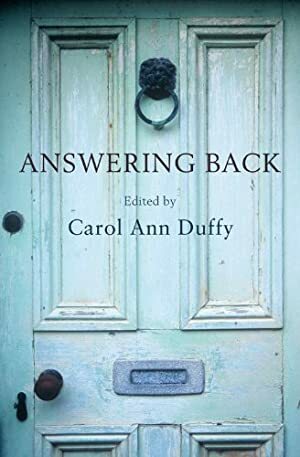 Teasing, subverting, arguing, echoing and - ultimately - illuminating, Answering Back is a vibrant, fascinating and timeless anthology, compiled by one of the nation's favourite poets. Track It. This book has been £6.64 within the past year. Log In to track Carol Ann Duffy on eReaderIQ. to be notified each time the price drops on any book by Carol Ann Duffy. to stop tracking Carol Ann Duffy. We started tracking this book on June 26, 2011. This book was £6.39 when we started tracking it. The price of this book has changed 41 times in the past 2,854 days. The current price of this book is £9.46 last checked one hour ago. This lowest price this book has been offered at in the past 90 days is £7.93. This lowest price this book has been offered at in the past year is £6.64. The lowest price to date was £3.59 last reached on December 11, 2013. This book has been £3.59 one time since we started tracking it. The highest price to date was £9.49 last reached on March 23, 2019. This book has been £9.49 2 times since we started tracking it. We last verified the price of this book about one hour ago. At that time, the price was £9.46. This price is subject to change. The price displayed on the Amazon.co.uk website at the time of purchase is the price you will pay for this book. Please confirm the price before making any purchases.